[Download] Official Samsung Galaxy A8 Android 6.0.1 Marshmallow Firmware. enjoying the android 6.0 features by flashing with Odin. After upgrade you can't downgrade to Lollipop again because there's a restriction. This update is also available Over-The-Air (OTA). If you are still on stock android 5.1 lollipop and your phone is not rooted, you can easily check and download the update by just going to Settings > About Phone > System Updates. The update fix many bugs and also increase device stability and performance. If for any reason you are unable to install update through OTA you can download firmware for you device model below and flash with ODIN. Marshmallow Firmware available for the following Galaxy A8 2016 variants: SM-A800F model, SM-A800I model, SM-A800K model, SM-A800L model, And SM-A800S Model. Others coming soon. 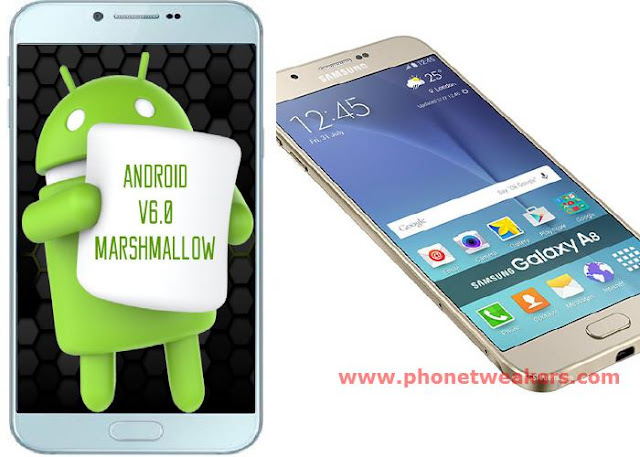 Phonetweakers: [Download] Official Samsung Galaxy A8 Android 6.0.1 Marshmallow Firmware.